This pie is very rich and full of chocolate flavor, so cut your servings small. The bourbon adds a wonderful flavor, so use it if you have it. To make the dough: (for step-by-step recipe with photos click here) Process flour, salt, and sugar in a food processor for a few seconds until combined. Add butter and pulse until mixture becomes crumbly and resembles coarse meal, about 15 pulses. Add 3 tablespoons water and keep pulsing, adding more water as needed until the dough isn’t dry and starts to clump together. Do not process to the point that a large ball of dough is formed, rather the dough should be quite crumbly with large clumps. Another way to check if it’s done, is to take a piece of dough and press it between your thumbs – the dough should stick well together without feeling dry or crumbly. Turn the dough to a floured surface and form into a ball. It should come together easily without being sticky. Flatten ball slightly with your hands to form a 1-inch thick disc. Wrap with plastic wrap and refrigerate for 1-2 hours. To make the filling: Chop the pecans into coarse pieces (or small pieces to make the pie easier to slice later on), reserving about 1/2 cup whole pecans for later decoration, if desired. Otherwise, chop all 2 cups. Heat butter and 55g chocolate together in a saucepan over low heat until melted. Add sugar, mix for 30 seconds and turn off heat. Mix in corn syrup. Let mixture cool slightly. Add eggs, bourbon, vanilla, and salt, and mix until well combined. Spread chopped pecans and 120g chopped chocolate evenly inside the chilled pie shell. Pour filling over the pecans and chocolate. 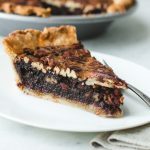 If you reserved pecans for decoration, decorate the surface of the pie with the pecans, pressing them in slightly so that they are coated with the filling. Bake for 45-55 minutes. The top should look set, but when you gently shake the dish, it should jiggle slightly, mostly in the center. Cover the edges of the pie loosely with aluminum foil (or pie crust shield if you have one) if it starts browning too much while baking. If the top of the pie is also browning too quickly, cover the whole pie loosely with aluminum foil. Allow pie to cool completely on a wire rack, then chill for at least 4 hours before serving so that the filling can set. Serve warm or at room temperature. Store pie in the fridge, covered, for up to 4-5 days.